Let me preface this with if you'd like to train with me message me! If you do not see availabiltiy on my calendar, ignore it and reach out to request your desired slot, as I have more flexibilty than what is available on the FYT calendar. As a personal trainer, my sole motivation is to provide clients with the total package of tools they need to attain their health and fitness goals to change and improve their lives. My fitness experience is more than 2 decades, I have an obsession with health, fitness and body shaping and I am a former Div I college athlete. I am a strong believer that physical fitness begins in your mind, and all positive changes start there first. Whether it's motivation you're lacking, you have injuries, or don’t know what to do, I will help you figure it out. I cater to your fitness needs, develop specialized workout programs for you, check-in on you, assess your eating, help you with your grocery list, advise equipment to use in your home. I'll even travel with you and literally hold your hand on your journey. All the way to your goals. Unsure? Let's meet for a consultation. Try out one session. That one session can potentially change your whole life. 1. What clients should expect when they train with me: A preliminary assessment. A challenging workout. Consistent motivation. 2. My favorite client story: A consistent one which is a client comes to me feeling weak, intimidated, hopeless, unattractive and depressed. After 4 weeks, they lose weight, are stronger, happier, more energetic and feeling better. Here's to saving lives one bicep curl at a time. 3. My favorite exercise: I love anything active. Even burpees. Which I hate. 4. My favorite quote: You've changed my life. You are my angel. Being called an angel (and not the Victoria's Secret kind) almost brought tears to my eyes. Except I have feelings of steel. So I don't cry. Even when I do. 5. My training philosophy: I'm your new BFF. BFFs can be annoying. I'm your new annoying but lovable BFF. 6. My training experience: I began in fitness 20+ years ago. Ebony is so much more than a trainer. She is helping me to comprehensively change my behaviors, and by extension, my life. The first thing I noticed upon meeting her was how hard she works and how much thought and effort she puts into each workout session. As I progressed into training with her exclusively, this individualized care only grew. She is challenging and tough, but working with her is helping me to physically and mentally achieve things I never thought I could do -- things I wouldn't have even tried. Ebony is very smart and a fantastic role model whose guidance on diet, exercise, and overall mindset has quickly become invaluable to me. I have been training with Ebony White for the past several months. Ebony is a very professional and talented trainer. She understands the human body and asks many questions about my fitness and weight loss goals, as well as my current habits. She has implemented a training program that fits my body type. She has also provided sensible, attainable dietary recommendations. It is always a pleasure training with Ebony because of her engaging personality and calm demeanor. She pushes me to my limits without being pushy or obnoxious. Thanks to Ebony, I am well on my way to achieving my fitness and weight goals. I highly recommend Ebony to anyone looking for a great trainer. When I began training with Ebony, I told her my goal was to lose at least ten pounds by the end of December. I had gained weight, felt tired & without energy. I was feeling a bit depressed. Ebony took on the challenge & guided me; this was the first time I had joined a gym or worked out consistently. She pushed me & made me believe in myself. Three months later I lost a total of seventeen pounds, feel stronger & more energetic. I also got rid of my large size clothes & I’m now wearing a smaller size. I feel much better about myself & look forward to going to the gym. Ebony is a professional trainer dedicated to her clients. I started private training sessions about five years ago, and Ebony is one of my all-time favorite trainers. 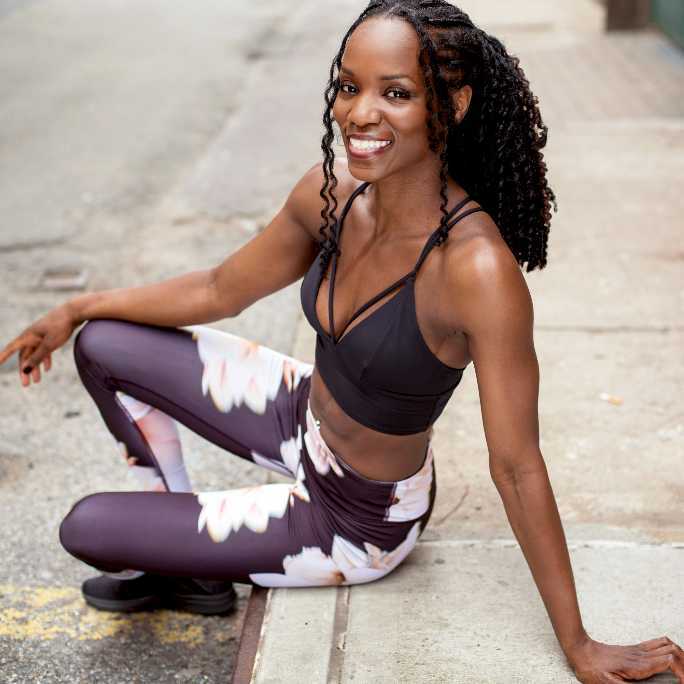 Ebony is just terrific - such a talented, professional, creative, supportive, driving fitness professional. During warm up on the treadmill or elliptical, that awkward time, we have just the right amount of conversation to make me comfortable and ready to work. She also notices and cares when I have made an improvement, and is continually changing our workouts so that they are creative, fun, and interesting. It doesn’t hurt that Ebony is also well-spoken, presents herself well and confidently, has enviable style, a good sense of humor, and is willing to offer bits of personal experience when appropriate. An hour session goes quickly during her workouts! Her enthusiasm is genuine and she makes me try harder. After my previous trainer moved away, I thought there would be a learning curve for their replacement. Ebony stepped in and continued the plan that I had with my previous trainer, and may have even pushed me a bit more. That is her expertise, to know when and how to push you, just beyond your limit, to get you where you want to be. Thai Massage with Ebony was AMAZING!! I would have stayed for two hours.